I am staying here for four days to be sheltered from a Typhoon. As here is in the middle of a river, the anchor is not working well. A Danforth is not working because of the river bed mud. I put CQR. The boat can be moored at the downstream side of the pier. In the upstream side, there are big motorboats which are under the marina’s engagement. Owners of those motorboats are friendly to sail boats people. A coin laundry, a food shop and a drug store are eight minutes walk away on the first inside main street from the river side. When you approach Kencho Pier, turn left at the confluence of the rivers and move up a little. Then you will see a big brown building, which is Tokushima Prefectural Office. In front of the office building, there is the pier managed by Tokushima Yacht Club. 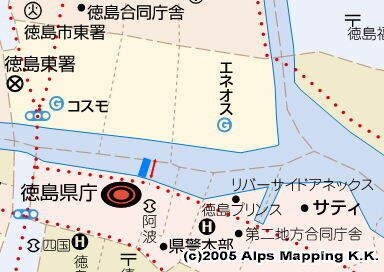 Moor your boat at the downstream side (see the red line in the map below) and call Tokushima Yacht Club at 088-664-0087. The mooring fee is free ! Water and Power at the pier. A clean 24hr available toilet is in a convenience store which is 100m downstream side and connected with a bridge managed by a hotel. A supermarket for provisions is 200m upstream left side. Ten minutes walk away.A public bath house called “Showa Onsen” is 13 minutes walk away. It is not a real hot spring, it is just a hot water. As here is the office area, there are many restaurants. “Yama” is a crowded and delicious with reasonable price Udon (a Japanese noodle) restaurant in front of Tokushima Station.